Well placed during an election season in which US foreign policy has been almost entirely displaced by a focus on the domestic economy – and specifically jobs – Rodney Brooks’ start up Rethink Robots has announced its first product, Baxter the ‘friendly faced factory robot.’ Dutifully (robotically, we might even say) picked up and repeated by the media, reports of Baxter’s arrival invariably emphasize the promise of a return of manufacturing to the homeland from offshore, made possible by an increase in American worker efficiency and U.S. competitiveness. Associated prospects of further U.S. job losses are muted in these stories, and in any case we’re reminded that U.S. factory workers have little to say since their unions have already been decimated by offshoring. Those few workers who are left, we’re assured, will come to love their Baxter co-workers as they learn how quickly they can be programmed to perform the menial assembly line tasks that have previously gone to even less empowered workers elsewhere. In the implicit elision of ‘the human’ and ‘we Americans’ that I’ve commented on with respect to remotely controlled weapon systems, IEEE Spectrum enthuses that ‘by improving the efficiency of human employees, [Rethink Robots’ products] could make making things in the industrialized world just as cost effective as making them in the developing world.’ I can’t help noting as well that Brook’s departure in 2008 from his previous start up, iRobot, and the founding of Rethink Robots coincides with (or perhaps precedes?) 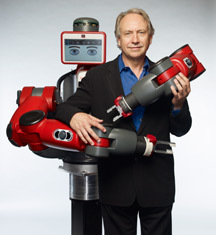 iRobot’s entry into the armed robots market (see Arming Robots). It’s at least possible that for Brooks, Rethink Robots represents not only a return to US manufacturing, but an escape from the global assembly line of remotely-controlled killing machines. A chaff of media stories entitled ‘Running Robot is Faster than Usain Bolt’ (or close variations) in the past week announce the unveiling of Boston Dynamics’ Cheetah robot, developed with funding from the Defense Advanced Research Projects Agency (DARPA). Invoking the name (as well as the persona and body) of the world record-breaking Jamaican sprinter who was the star of the recent London Olympics, these headlines suggest that a humanoid has for the first time outrun the fastest human. Closer inspection reveals that the Cheetah’s sprint occurred on a treadmill, with the robot tethered to the hydraulic pump that ensures its energy. In the genre of media proclamations of the arrival of artificial intelligence in 1997, on the occasion of Deep Blue’s chess victory over world champion Gary Kasparov, the headlines obscure the differences between robotic and human accomplishments, as well as the extensive networks of associated people and technologies that make those accomplishments possible. Taken on its own terms the Cheetah is unquestionably a remarkable machine, one of an extended family of masterfully engineered navigational robots created by Boston Dynamics over the past two decades. Inspired by nature, according to their designers, these robots are characterized by their uncanny resemblances to familiar animal figures and gaits – a resemblance that inspires a mix of affection and horror in the robots’ many commentators. I find myself experiencing more the latter in my own response to the video demonstrations of BigDog and other Boston Dynamics robots that densely populate YouTube. For some time now I’ve wanted to try to articulate the basis for my reaction, less one of horror perhaps than of distress. There’s no question that the distress begins with the plan for these machines’ conscription to serve as beasts of burden (and perhaps inevitably, bearers of weaponry) for the U.S. Military. The prospect of the appearance of BigDog and its kin in parts of the world distant from the Waltham warehouses of their creation, as part of the American military’s projection of force, further helps me to appreciate the latter’s invasive alienness and its attendant terrors for local populations. Coupled with this is the intensely technophilic, science fiction fantasies that inform these robots’ figuration as animate creatures, designed to inspire new forms of shock and awe. Combined with that ambition is the slavish subservience that the robots themselves materialize in concert with their human masters, exemplified in the act of kicking the robot that seems to be an obligatory element of every demonstration video, so that we can watch it stagger and right itself again. (As well as its explicit figuration as an animal – canine and/or insect – BigDog evokes for me the image of two stooped humans sharing a heavy load, one walking forward and one walking backwards.) More generally, I note the complete absence of any critical discussion of the wider context of these robots’ development, in service of the increasing automation of the so-called irregular warfare in which the United States is now interminably engaged. I wonder in the end how, within a very different political environment and funding regime, the extraordinary technical achievements of Boston Dynamics might be configured differently. This would require much greater imagination than currently inspires the field of robotics, as well as a radical change in our collective sense of what’s worth a headline.